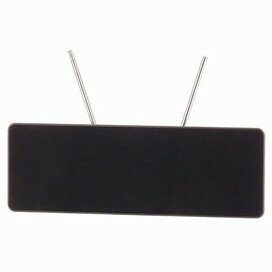 An indoor antenna that will sit unobtrusively near your TV. An extremely capable unit featuring signal clear technology with extremely low noise circuitry. It is able to pick up both UHF/VHF signals as well as DAB+ radio. It is also coupled with a separate amplifier with independent UHF and VHF gain adjustments to give you greater control over your signal. The amplifier can be powered with the supplied mains adaptor or from a USB cable (mini plug lead not supplied). Though the unit does not require the amplifier, it may be necessary for areas with weak indoor reception. This antenna may not work well in some areas if there is a reception problem in the area which we cannot avoid , however this is not guaranteed but in most of the cases it has not been a problem . Your TV has to have a built in Freeview or a Freeview decoder to use this. Please note I will not recommend this for places were the tower is very far away or no tower around that area,so please choose carefully before purchase as for obvious reasons it might not work at all or may just work or may really work well. Once purchased it will not be taken back for refund inspite of the results have been very good.